Most people approach the tiling of their bathroom with optimism and enthusiasm when what they really need is a bit of advice and tuition beforehand. Spending some time learning about tiling is well worth it if you’re to avoid uneven tiles which will look out of place against your shiny new bathroom accessories. If you plan to re-tile your bathroom to help you to sell your property, then you really need to make sure you get it right. So, read this advice and avoid the common mistakes that can often end up with an emergency call to a professional. You do this by measuring the area that you’ll be tiling and then working out how many tiles are needed to cover each square metre. Thankfully, tiles tend to come in boxes with this vital information included. Always try to buy tiles with matching batch numbers as this means they’re from the same production run so there should be no variation in shade or finish. Different types of tile need different types of grout and adhesive, so make sure you get the right ones. Some natural stone tiles also need sealant and you’ll need to apply this sealant before you fix the tiles in place. Your walls must be as flat as possible, even if this means re-plastering or putting up new boards. It’s worth the wait as uneven walls make for uneven tiles which are even more obvious. If you need to re-plaster, leave it to dry thoroughly. Look at the corners of the walls and any other places where you’ll need to use cut tiles and think about how you’ll cut them. Measure very carefully indeed and don’t rush things – you’ll be grateful in the long run. Use a spirit level to find the line which goes all the way around the room and make this your starting point. All your tiles will start here so that all the subsequent levels of tiles are straight. You also need to do this vertically so that the tiles are straight up as well as straight across. At first, only spread enough adhesive along small areas of wall – enough for two or three tiles. Keep checking with your spirit level to make sure each tile is straight before placing another one. 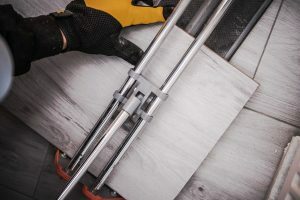 Thinner tiles need only hand cutters, but larger or thicker stone tiles may need an electric cutter, especially if you need to make complicated cuts. You need to wait for the adhesive to set and dry before grouting. You spread the grout along the lines and press it into place with a specialised tool. Once it’s dried, you can wash the tiles down to remove any grouting that’s outside its borders.